Beavercreek senior Kayla Vonder Embse (13) sets a pass in the second set that led to a point against Centerville, Oct. 10 at Beavercreek High School. 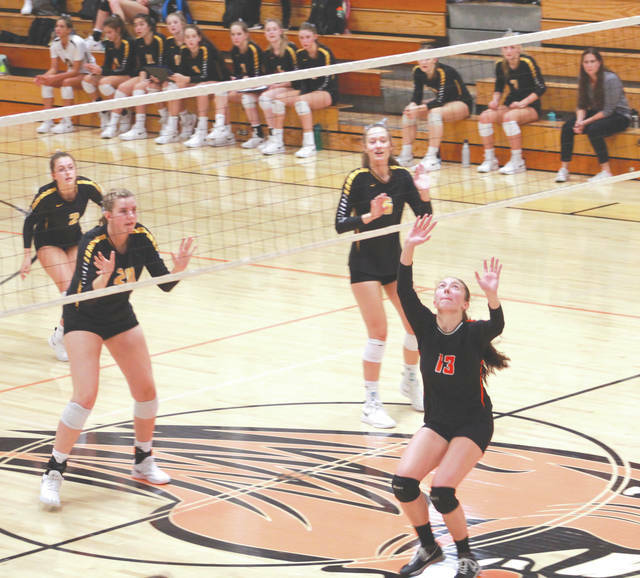 BEAVERCREEK — The Beavercreek High School girls volleyball team fell in heartbreaking fashion to the Centerville Elks, and watched the GWOC National East Division crown slip through their fingers. Beavercreek lost the match by a score of 25-15, 25-20, 17-25, 18-25, 14-16 on Oct 10. After winning the first two sets, Beavercreek looked to be in control, but they were unable to close out the match. The team struggled through the third and fourth sets and lost all their momentum. Centerville started to dominate the floor despite being down early. “They started getting the better of us on their serve and serve-receiving,” Green said. The Elks (15-5 overall, 11-1 in the Greater Western Ohio Conference’s National East division, looked like they were going to run away with the final set as well when they went on a 7-1 run to start the game, but the Beavers came storming back to take the lead. The Beavers (16-6, 9-3 GWOC East) ended up holding a 14-13 lead, needing just one point to win the set. While the set was competitively played, the Elks were able to get the final three points to win it. Junior Scottee Johnson led Centerville with 12 kills. Beavercreek sophomore Anna Shoemaker paced the Beavers with 19 kills. With the loss, the Beavers now turn their focus to the postseason with a new focus. Green expressed confidence the team would turn things around in practice and be ready for their next game. He said leadership was the key to moving on from a tough loss and said getting refocused is important. Beavercreek, the No. 3 seed in the Division I Dayton 1 bracket which will be contested at Butler High School in Vandalia, will play its first postseason game at 1 p.m. on Saturday, Oct 20 against either Butler or Fairmont.